Win a Fender Nate Mendel P Bass worth £886/$1,199! 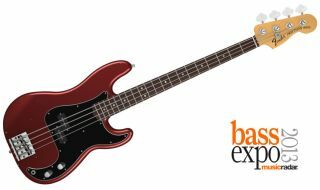 The inaugural MusicRadar Bass Expo, brought to you in partnership with The Institute, has finally arrives, and to celebrate we've teamed up with the good folks at Fender to offer you the chance to win a brand new Nate Mendel signature P Bass worth £886/$1,199! The prize is the signature model of Foo Fighters' bass stalwart, Nate Mendel. Based on his beloved 1971 Precision Bass, and featuring an extra-slim neck, Seymour Duncan Quarter Pound pickups and a Badass II bridge, it's a mighty fine and incredibly flexible instrument. Foo Fighters fans should also take note - you can read an exclusive two-part interview with Nate Mendel as part of the Bass Expo, as well as checking out all the latest bass gear from the likes of Fender, Ibanez, Cort, Hartke and Warwick. To be in with a chance of winning this highly desirable bag o' bass, just sign up to the MusicRadar Bass Expo newsletter on the link below. The competition is open to UK and USA residents and full terms and conditions apply. The winner will be drawn at random from all entries received by the closing date of 28 February. What is the Bass Expo? The MusicRadar Bass Expo 2013, in partnership with The Institute, is a free online bass show running 27-28 February, featuring high quality product demos, star interviews and exclusive video lessons. Check the MusicRadar home page for updates, or follow us on Twitter and Facebook to stay informed.